The Portland legislator promotes party unity, talks about reducing the role of superdelegates and takes a jab at Gov. Paul LePage. Rep. Diane Russell of Portland took a turn at center stage of the Democratic National Convention on Monday, using the national spotlight to promote party unity, talk about the state’s part in reducing the role of superdelegates and take a poke at Gov. Paul LePage. “I am a proud delegate for Bernie Sanders from the beautiful city of Portland, Maine,” Russell said in opening her remarks to the convention. Maine State Rep Diane Russell, a Bernie supporter, kinda killed it just now. She did a lot to unify the room. Well done! 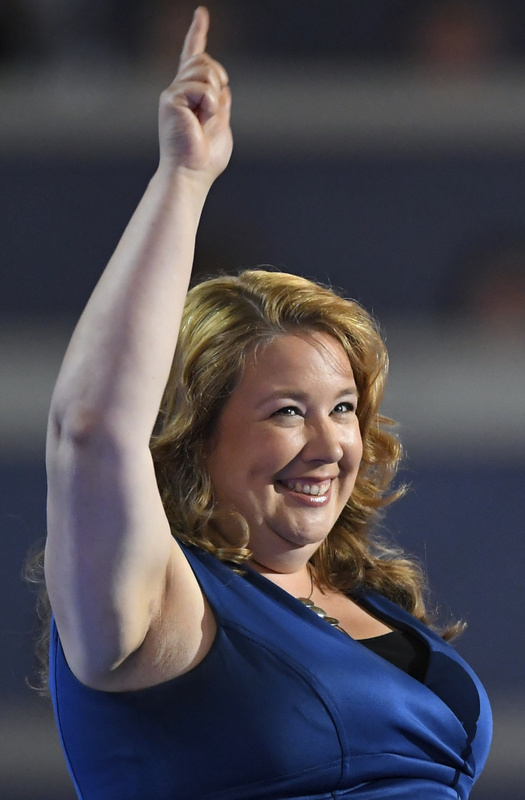 Russell, who was surprised when the Sanders campaign invited her to speak, told the crowd that she was the delegate who introduced the first amendment to reform the party’s superdelegate system. Superdelegates are not committed to any specific candidate, and can support any candidate regardless of who won a state’s primary. Republicans do not use superdelegates. She invoked the Dumbledore character from the “Harry Potter” books in explaining the dispute over the superdelegates. The convention’s rules committee struck a compromise Saturday regarding the future role of superdelegates. Efforts by Sanders’ supporters to pass amendments eliminating or limiting their power failed to win approval, but the sides agreed on a so-called “Unity Commission” to study the issue. Many of the superdelegates supported Hillary Clinton. The proposal under consideration would result in the reduction of superdelegates by two-thirds. A report on the issue must be presented to party officials by Jan. 1, 2018. “I want to be clear. We did not win this (superdelegate issue) by selling out. We won this by standing up,” Russell told the convention. She said Maine led the way to reaching a compromise. The Portland lawmaker also took a jab at Maine’s Republican governor. “Paul LePage is my governor. I don’t need to see anyone like him become president of this United States,” Russell said in an apparent reference to Republican nominee Donald Trump. Russell called on supporters of Sanders and Clinton to unite in the effort to defeat Trump. “Whether you support Bernie Sanders or Hillary Clinton, we are all in this together and we will all have a voice in the Clinton administration,” Russell said. “We can work together on so much, and despite the differences we may hold, a Donald Trump presidency will not only hurt our party, but it will hurt people, and I am not OK with that. Reached by telephone Monday night, Russell said she had never used a Teleprompter before Monday and only had the chance to rehearse her speech once. Ralph Carmona, a Clinton delegate, said he felt a lot better after listening to Bernie Sanders’ convention speech. He said Sanders did an exceptional job of presenting the case for voting for Clinton, touching on issues such as fighting against climate change that both candidates agree on. David Flores, a Sanders delegate from South Berwick, a lawyer and a former Marine, was disappointed that Sanders will not be the party’s nominee, but said it is time to move on. He heard Sanders speak earlier Monday. Seth Berner, a Sanders delegate from Portland, is angry that Sanders is asking his supporters to vote for Clinton. “I feel his backing away from what made him different from Hillary Clinton is a betrayal,” Berner said.